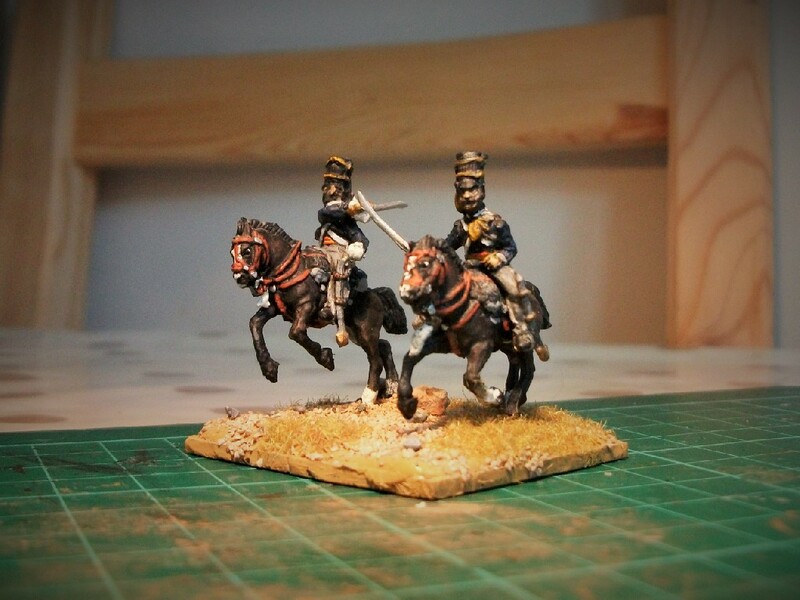 It’s been a long while since I showcased some of my Strelets Crimean War range, so I thought I’d dig some out. The Chasseurs d’Afrique (aka the “Chass d’Af”) featured memorably at the Battle of Balaklava, assisting the charge of the Light Brigade by clearing the Fedyukhin Heights of Russians. Phillipoteaux’s painting of the Chasseurs d’Afrique clearing Russian artillery from the Fedyukhin Heights during the battle of Balaclava. As with many Strelets figures, the sculpting is an acquired taste. The figures have lots of life and character to them, but undoubtedly lack the finesse and anatomical accuracy of some other manufacturers, particularly with the horses, I think. Furthermore, these were painted about 4 years or more ago, about the time I really took up figure painting properly as a hobby, rather than the occasional rough daubing of paint I had been doing. So my painting was still very much evolving at the time I painted these and I think it shows. 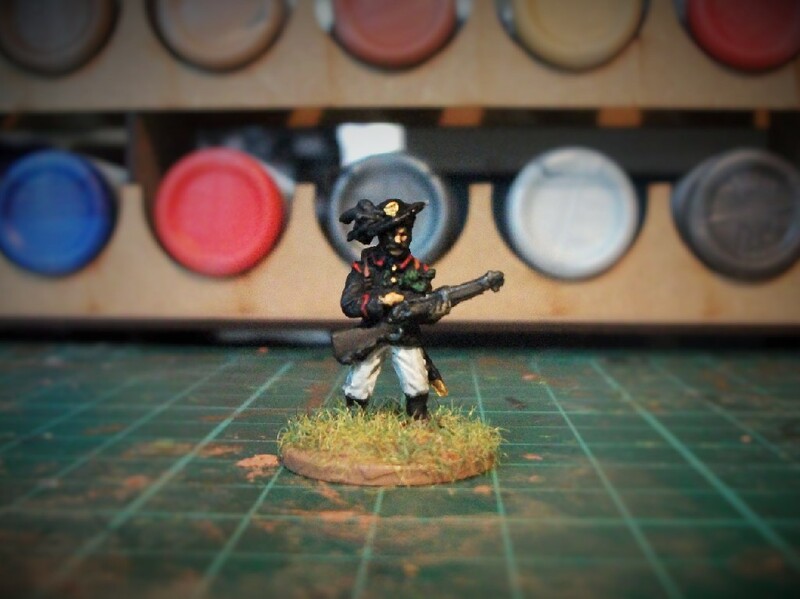 Strelets always have my gratitude for covering the Crimean War conflict in such detail and these Chasseurs d’Afrique make for a wonderful addition. 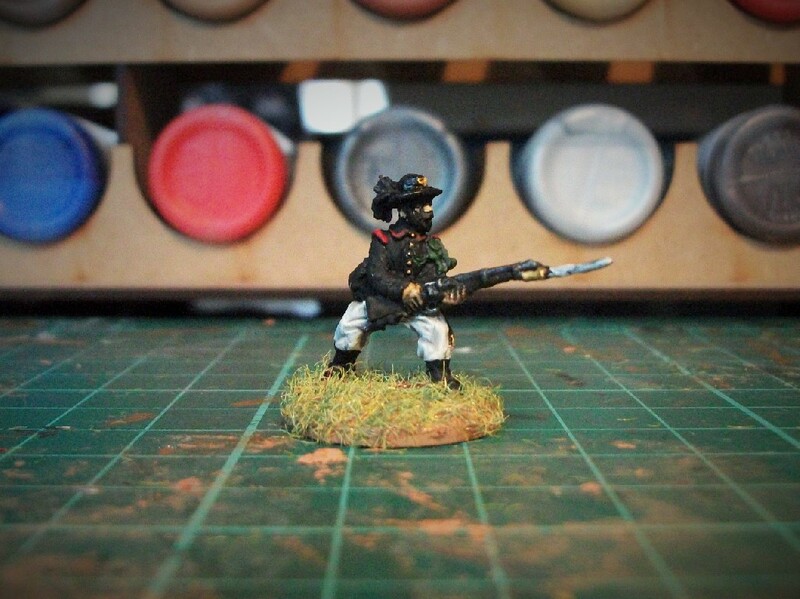 The prime purpose of this blog was originally painting figures rather than military history, but it seems that museum visits and assorted militaria has taken up the bulk of posts lately. So, I thought it maybe about time to show some figures that I’ve been working on these past couple of weeks or so. 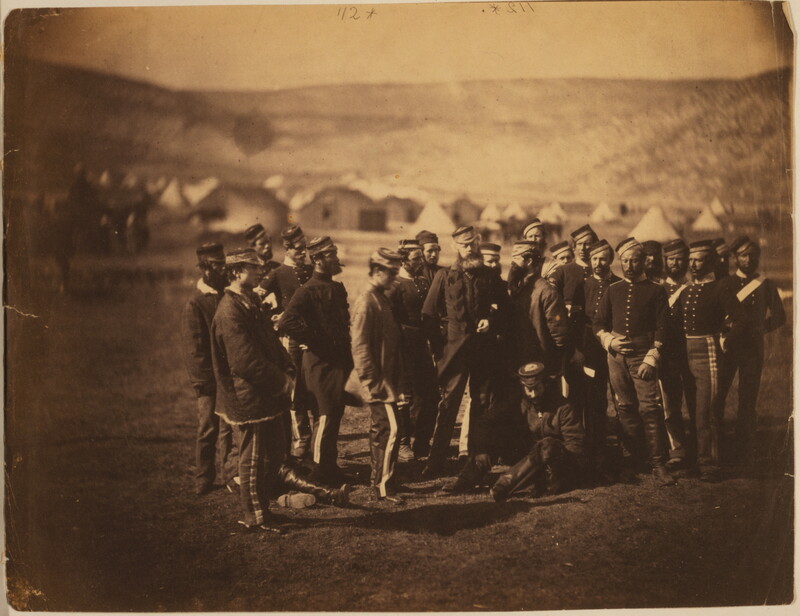 The Coldstream Guards, Crimea, 1854. And it’s another set by Strelets. I am continuing to plough through my boxes of figures from this series. This set is named “British Grenadiers in Summer Dress”, which differentiates the other set of guards produced featuring the figures wearing greatcoats. 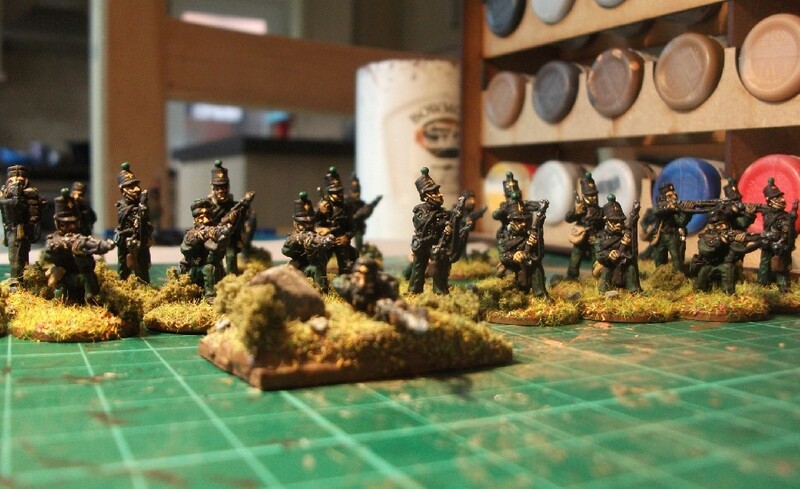 However, Strelets are incorrect because these are not grenadiers, they are guardsmen! They are Coldstream guardsmen, in fact. I can be this specific because the other Guards regiments in the Crimea (the Grenadier Guards and the Scots Fusilier Guards) did not have plumes on the right of their bearskins. Regimental Colour and cap badge. Players Cigarettes. 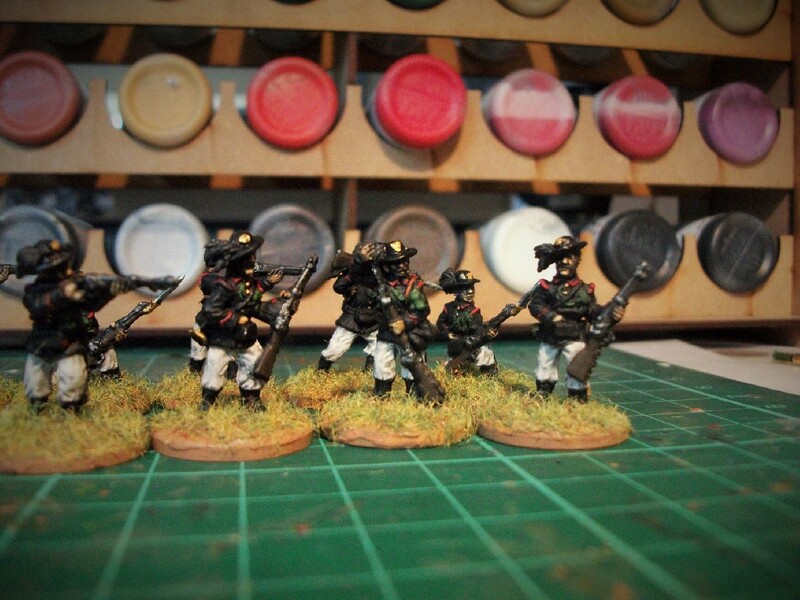 I’ve been busy putting the finishing touches to two of my Quiberon Expedition regiments. As I’ve been doing this, I realised that it’s been a while since I had a Featured Figures post, so I thought that it’s about time to dig out some figures from storage and showcase them here on the blog. 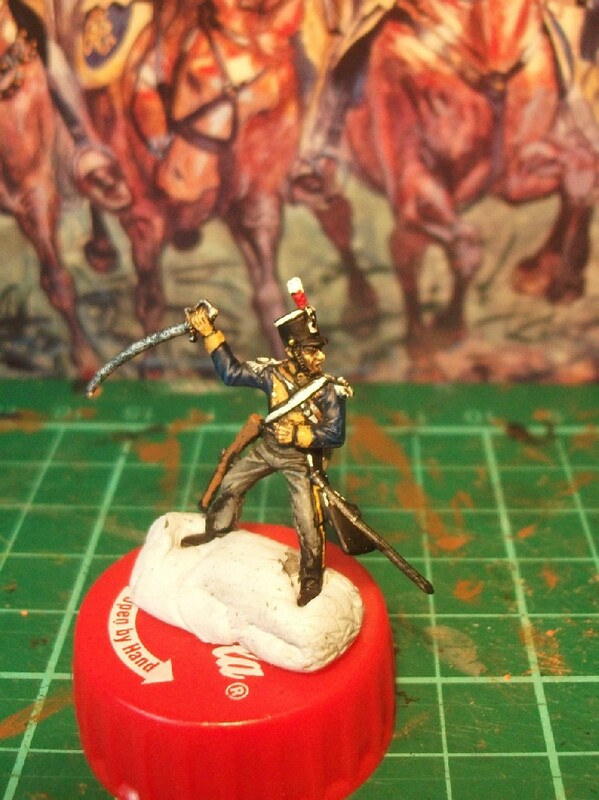 Let me tell you, I have lots of Strelets Crimean War figures to paint, especially Russians. 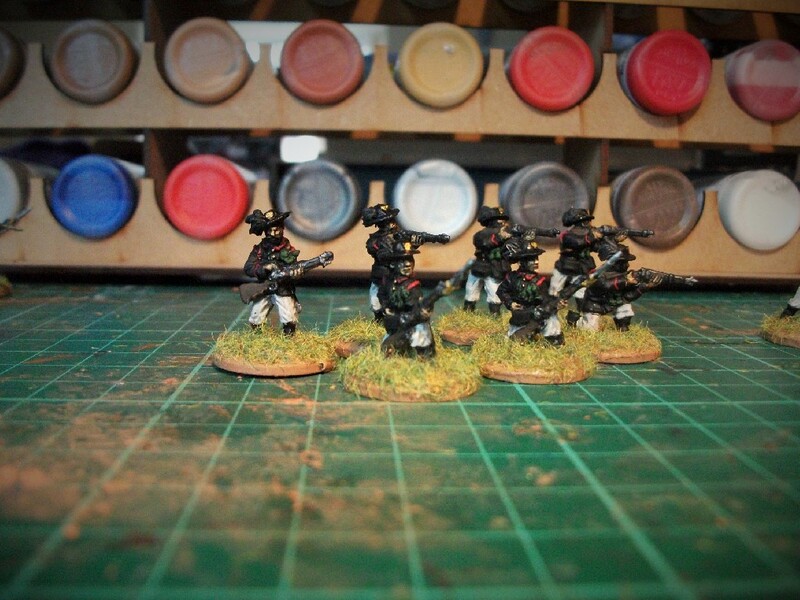 I have painted up a number of their infantry already, though. Strelets produced two sets of Russian infantry, one being listed simply as being ‘line infantry’ (and wearing grey greatcoats) and the other described as ‘grenadiers’ who simply appear without the large grey greatcoat. I think the description of being either grenadiers and line infantry is simply an alternative way of differentiating the “with” and “without” greatcoats sets. I also understand that, in practice, the average Russian soldier would wear his greatcoat virtually all the time in this campaign. Having the grenadiers set at least lets us see the classic Russian infantry green uniform in all its glory as well, but it’s the ‘line infantry’ boys that I’m looking at in this post. As with all Strelets figures, the sculpting may not be to everyone’s liking. What these figures may lack in elegance, they often more than make up for in character and expression. 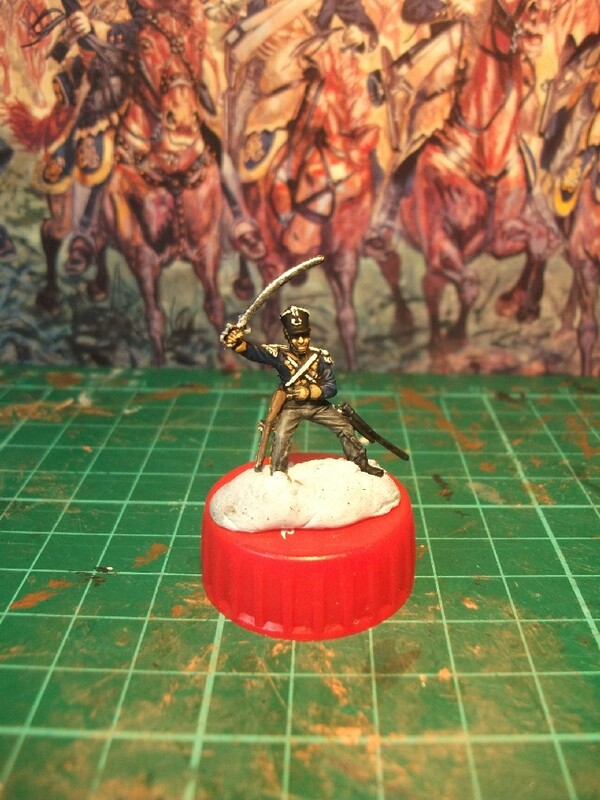 The Russian Line Infantry set has a different pose for every single figure. Consequently, we see Ivan the Soldier either calling out to his comrades; reaching into a pocket; carrying his musket in a bewildering variety of ways; in the process of tearing off his coat in frustration(! ); or even just contemplating the hideous folly of war while leaning wistfully with chin on musket (in a manner liable to blow his brains out if he’s not careful)! With such a wide variety of poses, not to say dizzying variety of sets released for this campaign, painting Strelets is often great fun. And fun is surely what it’s all about with hobbies, after all! I do plan to finish the whole box of these guys – one day. 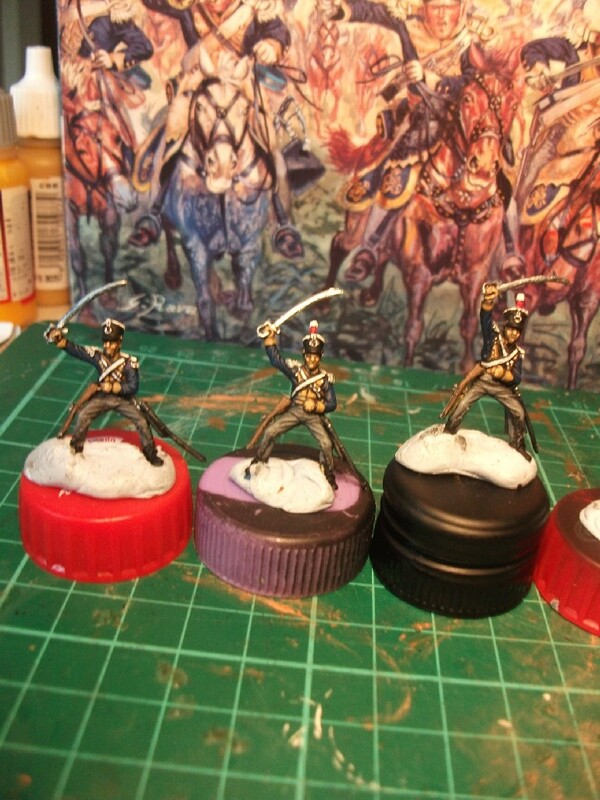 Maybe then I can get on with the painting all my Urak Cossacks, the sailors and cannons, the ‘grenadier’ infantry, the Don Cossacks, the general and hospital staff, the hussars, the dragoons, the Terek Cossacks, etc., etc.! But it’s back to more Strelets for now, as I’m doggedly pushing on with my Quiberon Expedition Project. In a short break from the modelling, it’s time to talk military history. A public holiday offered the chance of a day trip out to a military museum that I hadn’t visited before. 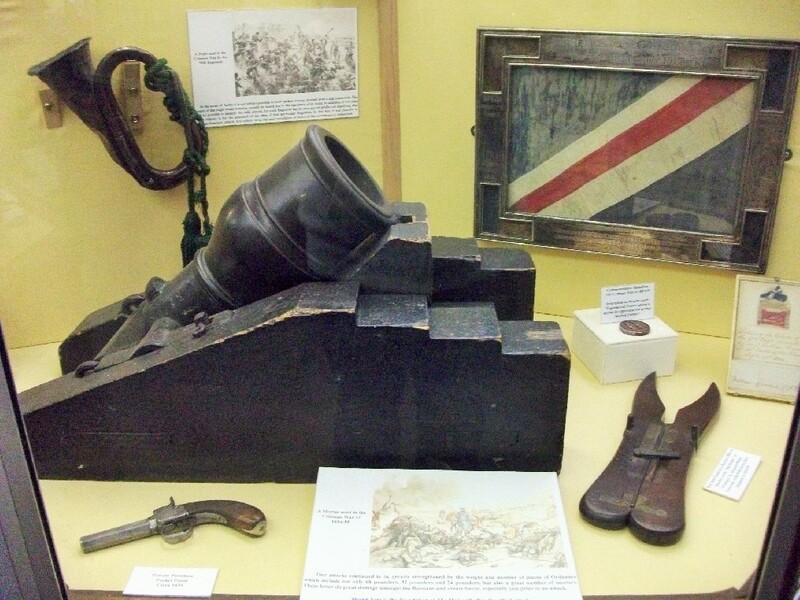 The Sherwood Foresters Museum is based in Nottingham Castle and contains artefacts relating to the 45th Nottinghamshire and the 95th Derbyshire regiments; also the Derbyshire and Royal Sherwood Foresters Militias (militia and rifle volunteers); and related local volunteer battalions. I was expecting a modest display but in fact was really impressed by the quality and range of exhibits. There were plenty of uniforms, headgear and weapons on display; perfect for a military history nerd like me! 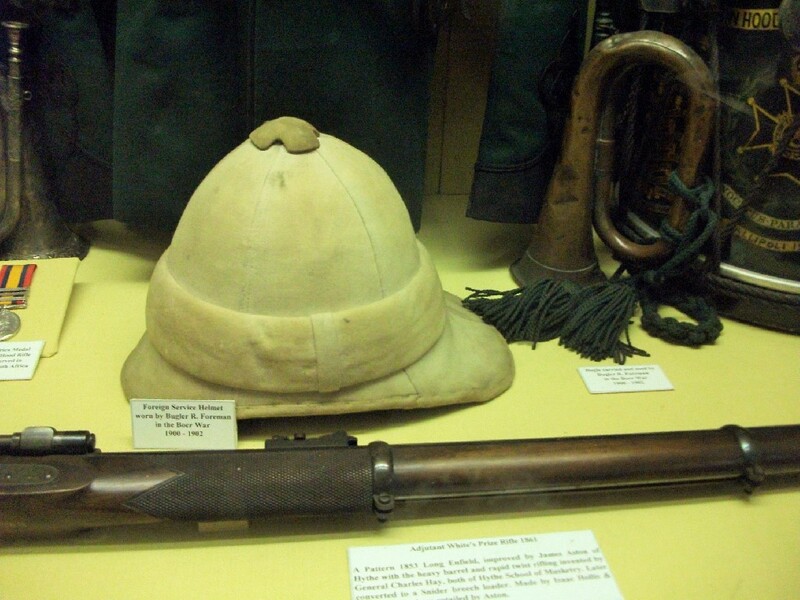 Boer War pith helmet and bugle. 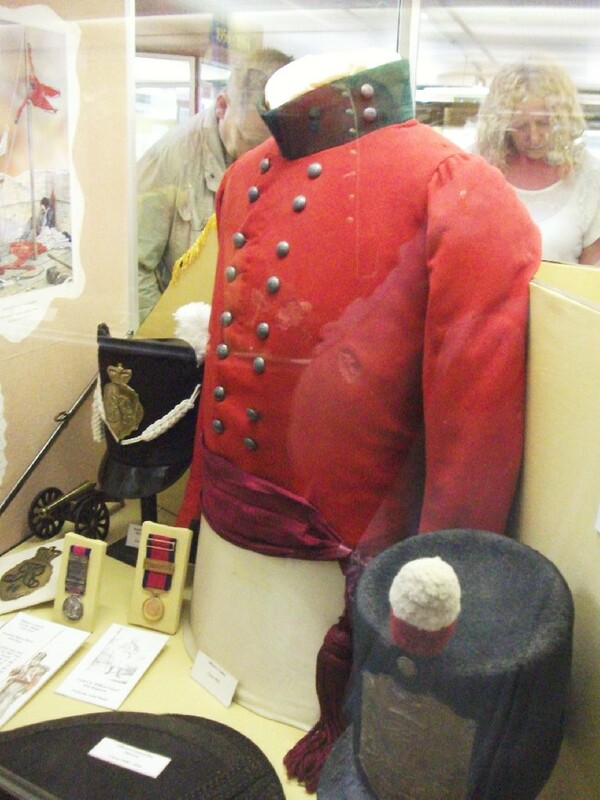 Napoleonic officer’s coat with excellent examples of a Waterloo Belgic shako (top left), an officers bicorn hat (bottom left), and Stovepipe Shako (bottom right). 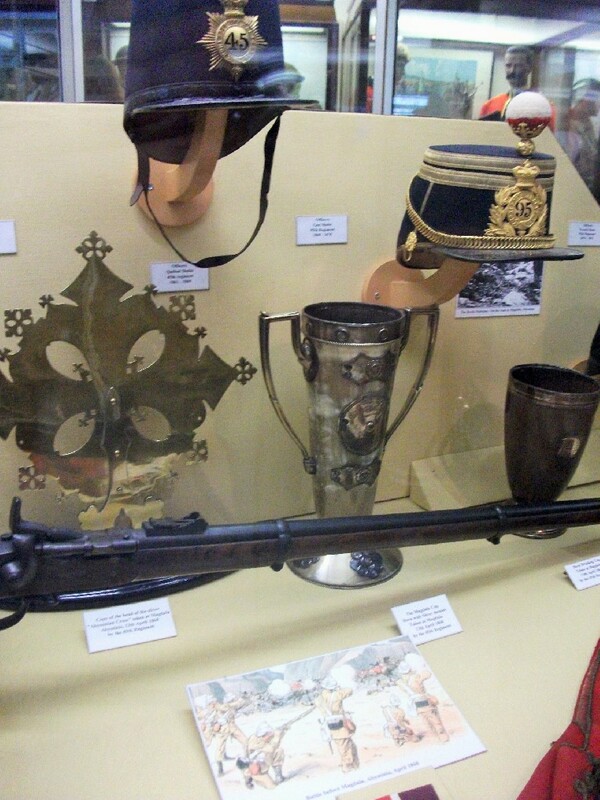 Above are fascinating examples of Crimean War era headgear. 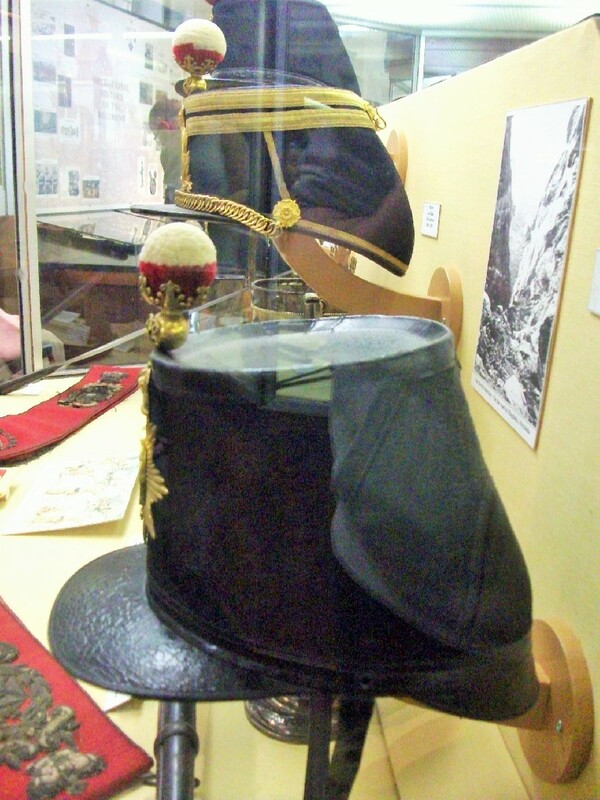 A Quilted Albert Shako (top), Albert “Last” Shako with braiding (middle) and a similar but distinctly taller French style shako (foreground). 1830s era uniforms with the large Bell Top Shako. Check out those epaulettes! 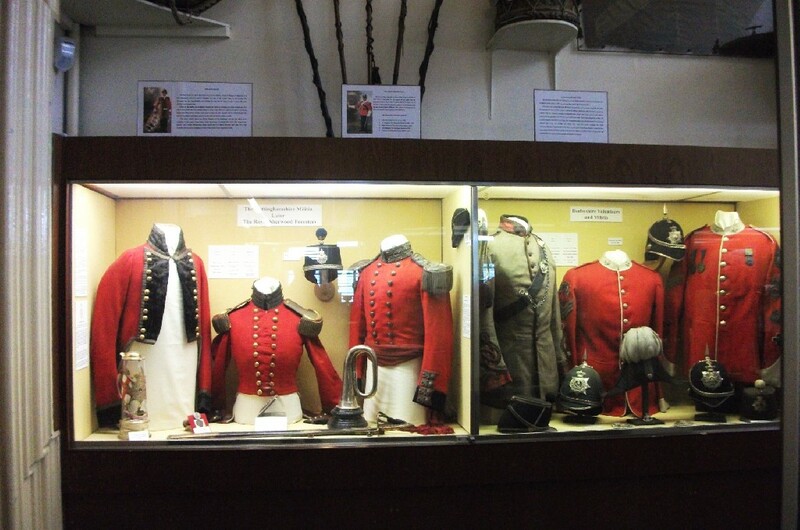 Notts and Derbyshire Militia & Volunteers uniform displays. Prior to the visit, I was reading a book review recently in my Victorian Military Society journal about the siege of Magdala in the Abyssinian campaign of 1868, so was delighted to coincidentally find some related artefacts to this campaign. There are claims to have such war booty returned to Ethiopia. It’s a contentious subject for sure, but for now it was wonderful to get the opportunity to see these astonishing objects close up. Artefacts taken from the fortress of King “Theodore’s” Magdala in Abyssinia: ‘The Magdala Cross’ and ‘The Magdala Cup’, one of several made of horn and silver. 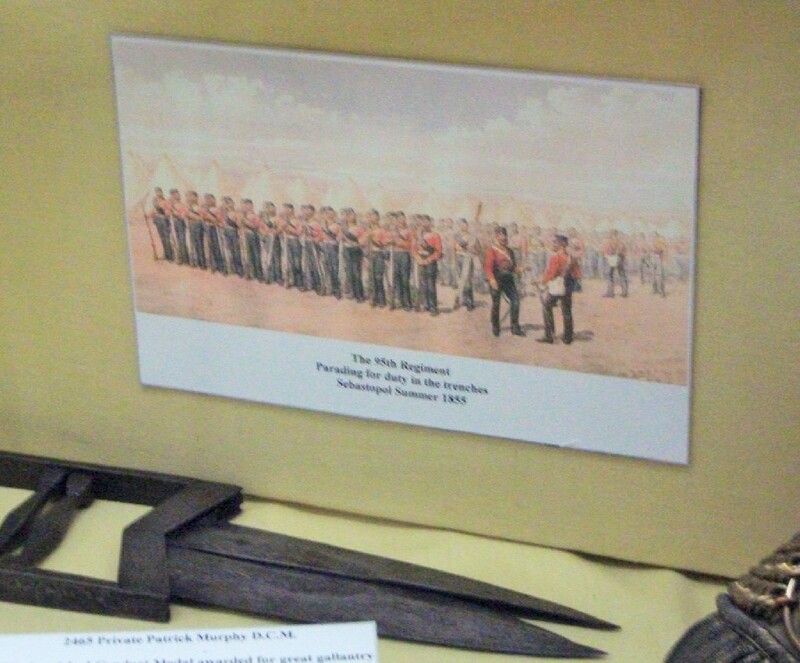 The Crimean War has long been a favourite subject of Suburban Militarism, so I was pleased to see numerous artefacts relating to that conflict, as well. 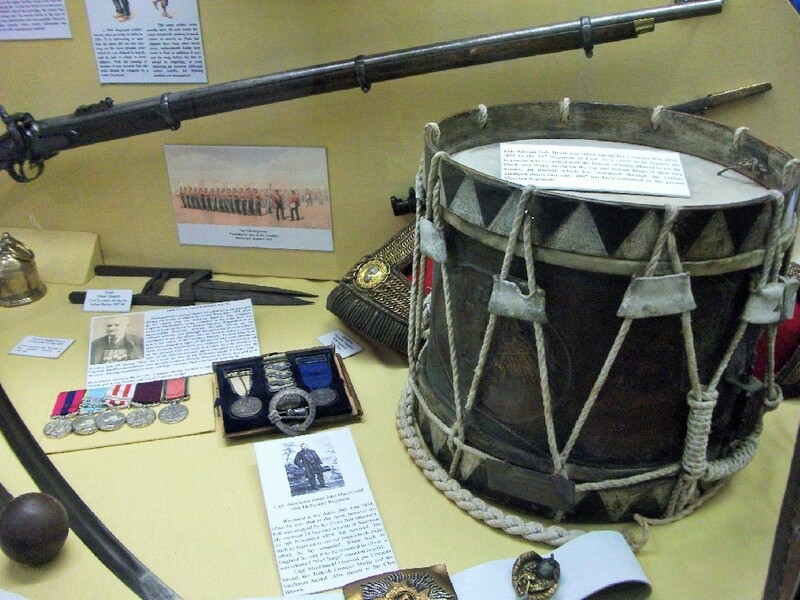 There was a small mortar from the siege of Sevastopol and also a captured Russian drum whose black and white pattern was later deliberately replicated on the 95th’s own regimental drum. Above – Capt. 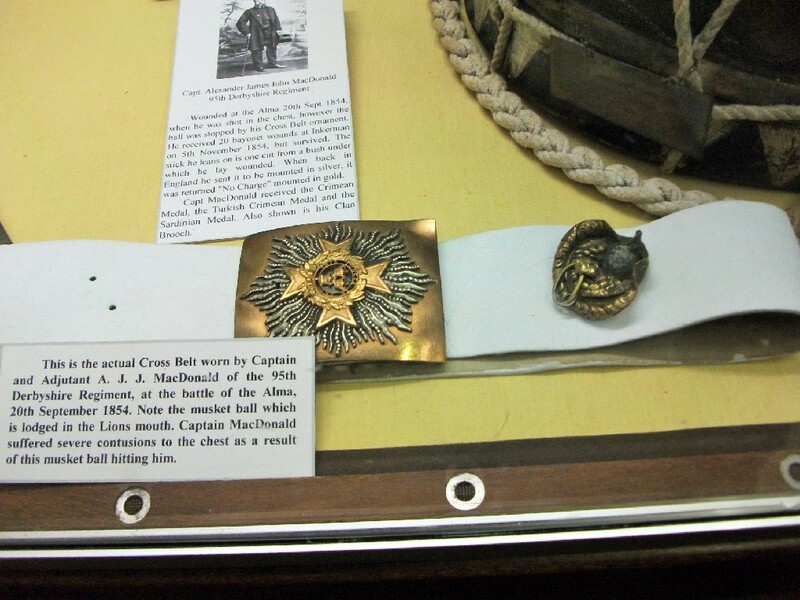 MacDonald of the 95th’s cross belt. Astonishingly, a Russian musket ball remains lodged in the brass lion’s mouth. Having thus barely survived the battle of the Alma, he later survived 20 bayonet wounds received at the later battle of Inkerman too! By the time of the Crimea, the regiment had been renamed “The Rifle Brigade”. It took part in the battles of Alma and Inkerman as well as the lengthy siege of Sevastapol, in the process winning more Victoria Crosses than any other single regiment during that campaign. After WWII, the regiment was merged to form the Royal Green Jackets alongside the Oxfordshire and Buckinghamshire Light Infantry Regiment and its sister Rifle Regiment; The King’s Royal Rifle Corps. 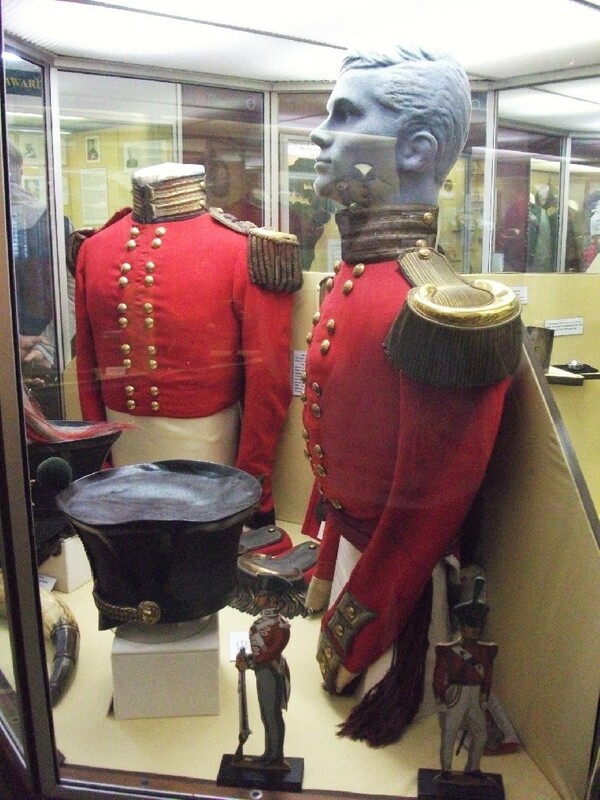 I had my first visit to the mighty Royal Green Jackets museum in Winchester in 2013 which featured much about the Crimean War and was quite possibly the best military museum that I’ve ever visited! Anyhow. 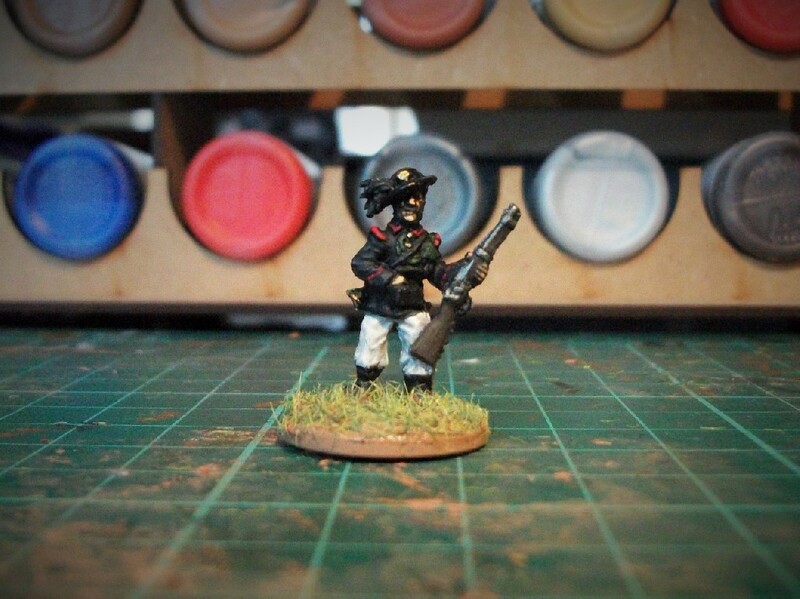 This is a blog about little plastic soldiers. So bring on the figures! Note that some wear the despised Albert Shako but the remainder have opted for the Kilmarnock cap. The ‘featured figures’ this time, as promised, are the Sardinians from Ukrainian manufacturer, Strelets. 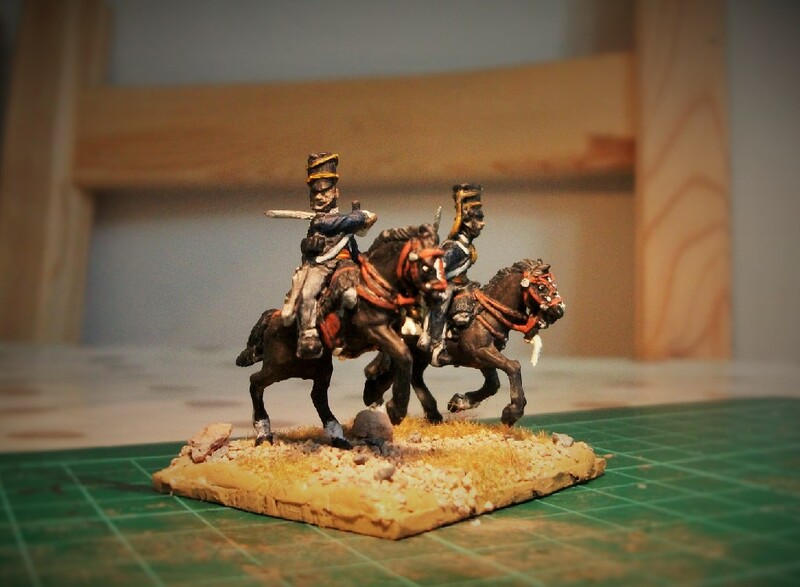 This is part of their impressively diverse Crimean War range, which I have been avidly painting on and off for a year or so now. The box lists these figures as Sardinians. What they specifically depict is the Bersaglieri, a famous elite regiment from Italy. The regular Sardinian infantry has never been released and so this set is likely to be the only one depicting the Sardinian forces for that campaign. I read some criticism on a forum somewhere that this was a pointless release as the Sardinian contribution to the Crimean War was negligible. This is unfair. Although the junior partner in the allied war effort and a late-comer, the Sardinians provided essential fresh manpower at a time the British, Turks and French sorely needed it when the war’s attrition rate began to tell. Furthermore, the Sardinians did take a full part in battle and apparently impressed observers immensely. Some of my Crimean Sardinian Bersaglieri. Some Crimean Sardinian Bersaglieri by Strelets. Plastic Soldier Review offers some criticism that it is possible the Sardinians didn’t wear the uniform portrayed here, but instead wore long greatcoats. That’s as maybe but in their vivid black and white, they make for a visually attractive figure; particularly when displayed with the scarlet-coated British, the green-coated Russians and the blue-coated French. Loading. A figure from Strelets Sardinian Bersaglieri. A figure from Strelets Sardinian Bersaglieri. En guard! Strelets Sardinian Bersaglieri. Hello. After endless login problems with this blog’s previous incarnation, Suburban Militarism has moved to WordPress. Which at least gives me a chance to start anew and begin by offering some self-reflection. In essence, what is “Suburban Militarism” all about? 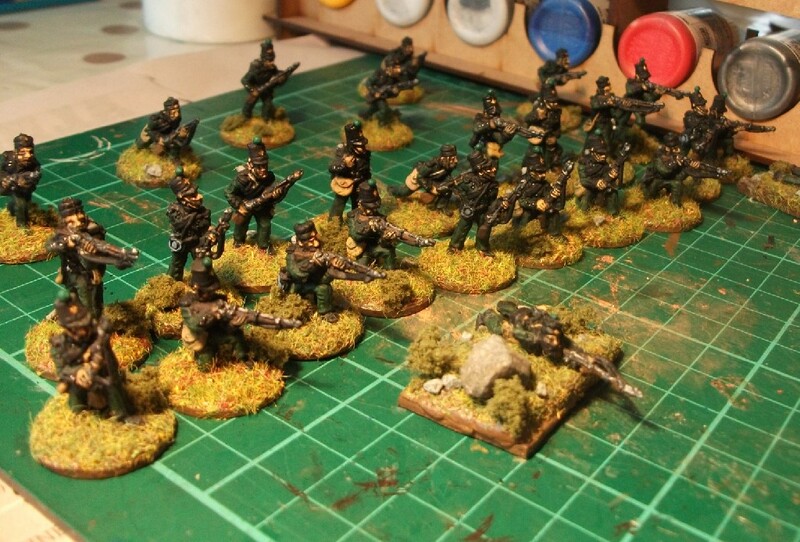 It is a record of my hobby, which is to say in essence the painting of 1/72 scale plastic soldiers. Military history, particularly of the 18th-19th centuries, was a topic that always engrossed me as a boy and captivated my imagination. I recall at school one day when the class was given the opportunity of writing an essay on any subject they liked. I chose ‘The Battle of Waterloo’, which I wrote about with gusto. It was to my surprise that nobody else seemed to share an interest in an even remotely similar topic! This was the first indication that my great love was potentially an odd or even uncool one and therefore something that might have to be kept secret. Quietly, I amassed a collection of plastic soldiers (mostly Airfix and Esci) numbering into the 1000s, which was not a bad achievement for someone relying on pocket money, Christmas and parental generosity. I sorted and paraded them regularly. Although I had figures spanning a variety of periods, my first and principle love remained with the 18th/19th century European armies. There was something about all that riot of colour so neatly aligned in elegant lines and squares that appealed to me in some romantic way. Unfortunately, all that ‘riot of colour’ didn’t extend to my own armies. Quite simply, I didn’t have the patience, knowledge or skill to paint them. I didn’t know where to begin and I certainly didn’t know anybody else who shared my esoteric interest who could advise and encourage. Until one day, decades later when, well in to my thirties, I rediscovered the old troops in my parents loft. 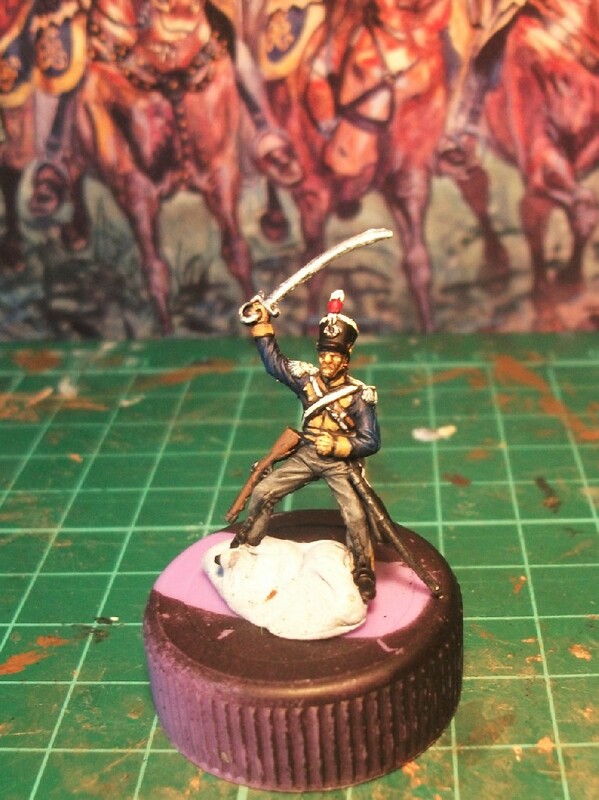 Initially, I had a go at casting and painting up some 25mm Prince August figures with some moulds I’d found. The results were encouraging. These sporadic attempts at painting them continued for a few years until I entered a local hobby shop. 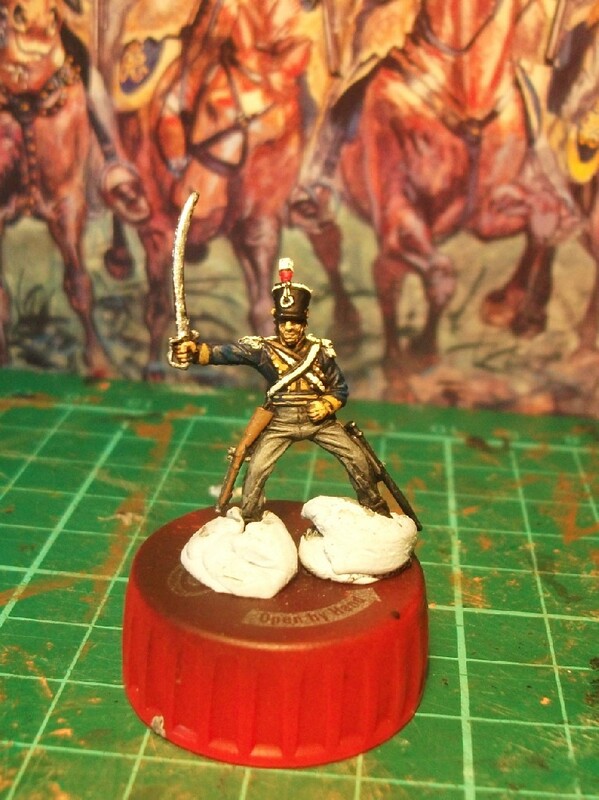 There before me were endless boxes of Napoleonic plastic 1/72 scale troops. I was like Augustus Gloop seeing the inside of Wonka’s chocolate factory for the first time. Pure heaven! I was astonished that there was so much variety as I’d never seen anything remotely like this when I was younger. 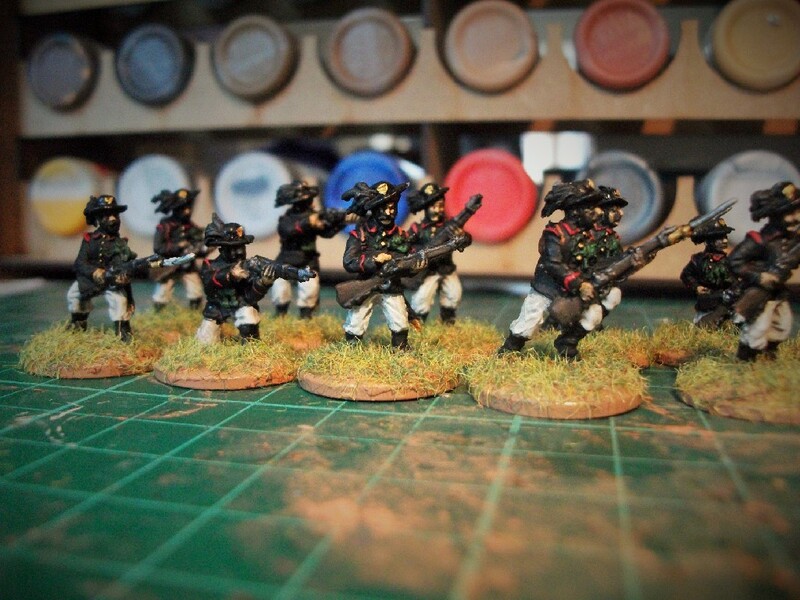 I was lucky to find a box of French Imperial Guard! 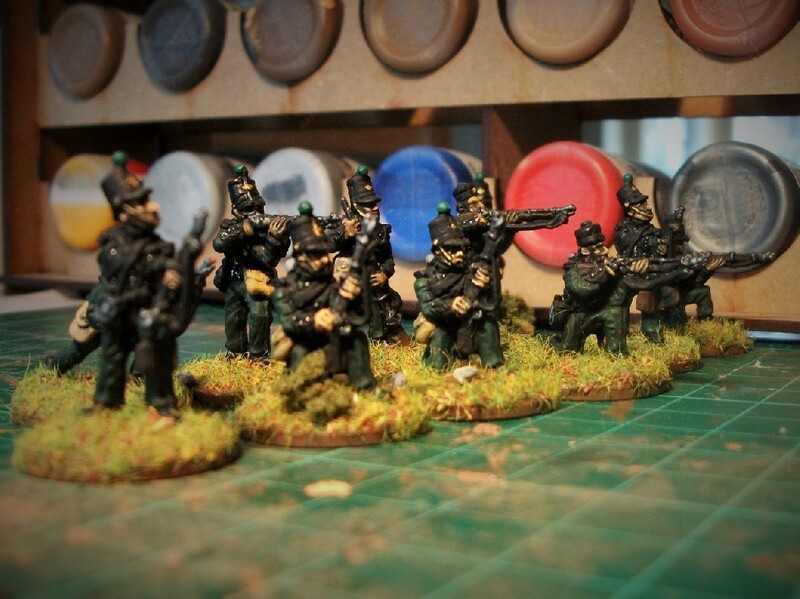 In that shop, I fell in love all over again with the little guys and immediately bought a couple of cheap boxes of Prussians. Colonel D’Ascoyne himself, with the dependable Captain Bennett leaning away off to his right. And I never looked back. 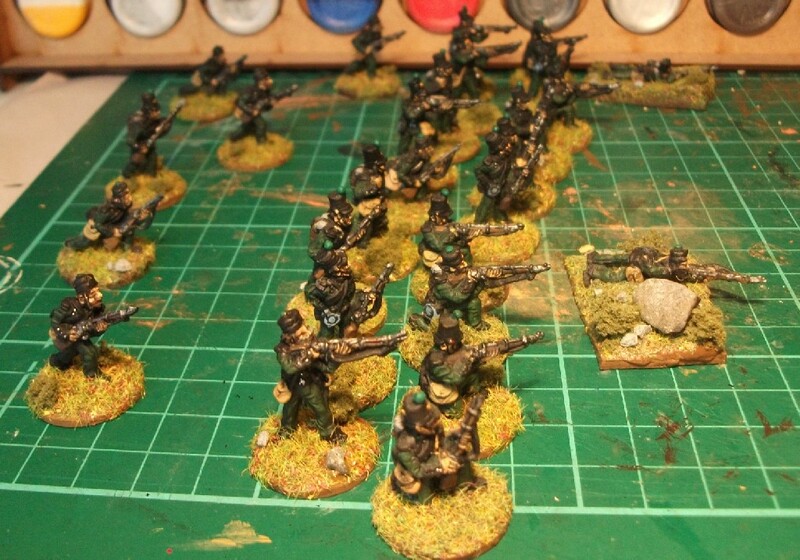 Making up for all those years as a boy with troops without any colour, I now paint them in every hue. This blog is a record of that renaissance. A little bit of militarism tucked away in Suburbia. Few know of my hobby outside of my immediate family. Behind those net curtains, one man builds an army.